If you want to be prepared for a new flu season, then I have an amazing tip for you: How To Kick Colds Fast With A Detox Bath For Kids. Calm, detox, and make your kids’ immune system strong. An Epsom salt bath is a natural remedy that really works! After several years of learning about natural remedies, a good detox bath for kids is one of my favorite ways of kicking a cold fast. Taking a detox bath will help your kids relax, clean their systems of toxins, and absorb wonderful minerals that will strengthen their immune systems. After a full day of activities, your kids are feeling miserable because of a cold. They are cracky, congested, irritable and just a mess. A detox bath is the perfect way to make them feel better and relaxed when they are sick. In my experience, it really helps. My 5 year old son caught a cold a few weeks ago. The same day he started to show cold symptoms, I made sure to give him a detox bath. He slept for 12 hours straight afterwards! He woke up the following morning feeling much better. This is when I realized I had to write a post about this amazing home remedy. I try to take a detox bath once a week too. An Epsom salt bath is so relaxing and I feel completely rested and energized the following day. If you want to learn all about detox baths and why you should take them, please see this wonderful article 5 Amazing Healthy Reasons Why Your Children Need Detox Baths. It explains in depth all the wonderful benefits of taking a detox bath. Kids: All you need is 1/2 cup of Epsom Salts, and 2 tablespoons of baking soda (To help promote elimination of toxins and clean unfiltered water). If your child weighs 60 pounds or more, use 1 cup. It is important to use essential oils that are safe for kids, and dilute according to instructions. For more information, please check out safe essential oils for children. There is a fantastic variety of safe oils for children above the age of 2. Fill the bathtub half way with warm water. Place the salts and baking soda, and stir with your hand to dissolve. Take a bath for at least 15-20 minutes. The body will extract the toxins first, and then start to absorb the minerals. To distract kids, you can play with toys or read a book. Make sure they do not drink the water. Magnesium can have a laxative effect if ingested. Rinse well afterwards and towel dry. The detox bath for kids is now complete. Have some drinking water available. A detox bath can make you very thirsty. Magnesium also promotes sleep so you or your kids will soon be ready for bed. Now you know How To Kick Colds Fast With A Detox Bath For Kids. At the first sign of a cold, give your kids this bath and see for yourself the wonderful results. If you want to make it super fun and exciting for kids, check out my latest DIY idea: Detox Bath Bombs For Kids! If you are interested in more natural ways to strengthen the immune system, please see 7 Ways To Boost Immunity And Get Ready For Flu Season and 6 Natural Ways To Protect Your Family From The Flu. ***UPDATE*** Several people are telling me their kids do not sleep well. This detox bath definitely helps my two kids relax and sleep better. If you are also looking for a kid’s multivitamin that has magnesium, please check out Natural Vitality Kids Calm Multivitamin. It is good for kids 4 years and older. I give this to 5 year old son and it works great. Contains magnesium, Omega-3 DHA & EPA, and 24 organic fruits & veggies. Magnesium is a miracle mineral. I take it myself, and it has helped me a lot when dealing with anxiety. See my personal experience HERE. 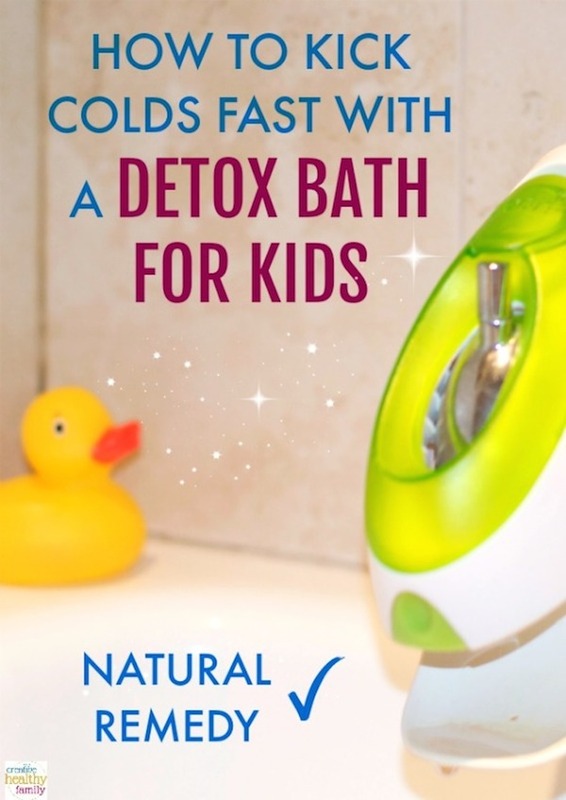 I hope this Detox Bath For Kids post helps you and your family. It really works for us and we always have Epsom salts available at home. Magnesium is so wonderful! If you have any questions please feel free to contact me. Hi! I have a 15 month old who has a hard time falling asleep and staying asleep. What would be the correct anoint of Epson salt and backing soda for her? Hi Olga, my daughter is 16 months old and takes a detox bath approximately once a week with 1/2 cup Epson salts and 2 tablespoons baking soda. You can also look for a magnesium supplement at a health store and give the recommended dose at night to help her sleep better. Remember this information should not replace professional advice by a qualified medical or herbal practitioner. Would Dr. Teal’s Soaking Solution, Detox and Energize work? Hi Perla, I do not know the product but you can check the ingredients. If it contains only Epsom salts (magnesium sulfate) it should be fine. Check also for any warnings. Dr teals contains “frangrance,” which nulls getting rid of the body’s toxins. Can I bathe them regularly after? Shampoo/body wash? Yes, just make sure you use a natural shampoo or body wash.
Of course! Always! Thanks so much! I’m so excited to do this for the kids. My son just turned one. Can I use this on him? Can they be bathed in the same water or do you need to refill tub with fresh water? Hi Karen, what I do is empty the tub first and then rinse them with new running water. This is when I use shampoo or body wash.
Is this safe while pregnant? I have heard both ways. I have read that epson salt is totally safe while pregnant, but have also read not to detox while pregnant. I know not to use super hot water…. Hi Sarah, I have read also that Epsom salts are not safe if ingested while pregnant, but that they are safe for taking baths. In any case, if you are pregnant, check with your doctor at your next visit. I try to take weekly epsom salt baths with lavender (that usually last 40 min ????) I’m 27 weeks pregnant and stayed the routine around week 15. I also took them weekly with my 1st pregnancy up until being induced. I was “at risk” for High BP because of family history and always had great readings which I completely attribute to the baths!! It was a glorious pregnancy and if I’m consistent I notice a better feeling this 2nd time too!! Also I’ve given my daughter since about 13 mo (she’s 21mo now) epsom salt baths with lavender for colds, rashes, bug bites or the dreaded boil… greatf quick results every time!! Hi, where can I buy magnesium flakes?. There are several in the market, could you pls let me know. As you said in the pharagraph can I use only baking soda & Epsom salt? Hi Raza, there are links in this post for the products I use at home and I recommend. You can buy Epsom salts or magnesium flakes, they are the same. Use one of them with baking soda (also in the post with a link). Just click on the blue text and it will take you to where you can buy the products. I took Epsom salt baths every night during my pregnancy. It helped with leg cramps, preventing swelling, and back pain. My midwife was pleased with the results. Completely unrelated, however my sons iron levels have always been on the low side. He’s four and is the pickiest eater on the planet. Do you have any suggestions for a good multivitamin that I can give him that tastes good. I don’t want to have to fight him to take it. Hi Jeanette, I recommend a great multivitamin in this post at the very end. I also like the Garden Of Life kid’s multivitamins and you can get them online or at a health store. Whole Foods has a liquid multivitamin for kids (can’t remember the name) that doesn’t have any flavors so that also could be an option for you son. You can ask at the store and I am sure they will find it for you 🙂 Hope this information helps! I would suggest cooking as many meals as possible in cast iron cookware. My iron levels were super high last summer during my second pregnancy, which I attribute to cooking at least one meal a day in my cast iron skillet! Thank you Katie. Great information! I’m a science-minded person and this is just not sitting well with me. 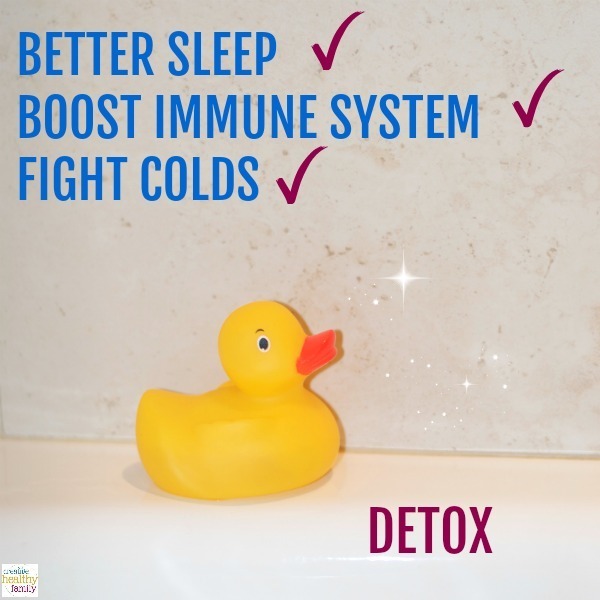 While I don’t think a nice relaxing bath is a bad thing for a kid with a cold, you cannot “detox” a cold out of someone. Even if I believed in detox baths (I don’t, because they don’t actually work) I’d be operating under the pretense that it draws toxins out of the body. A cold is a virus, not a toxin. So by what mechanism is the detox bath helping to cure a virus faster? Hi Trish, thank you for your comment. By getting rid of toxins in the body and absorbing the minerals, you can help boost the immune system. A stronger immune system can fight viruses better. I am a huge believer in natural remedies and these baths really work well for us. When my kids are sick it makes them sleep better also because it is so relaxing. Remember this information should not replace professional advice by a qualified medical or herbal practitioner. Hi Kelly, I have been giving my daughter these baths since she was about 10 months old. I was extra careful that she would not drink the water. Magnesium is dangerous if ingested because it can cause diarrhea. That would be my concern in your case. You can always check with your pediatrician and see what she/he thinks. You really need a bathtub for this type of bath. Good idea Jorie. Thank you! Hi! i like to try this detox bath to my kids, they’re 4 and 7yrs old and they catch cold easily so i got interested in this..problem is we don’t have a bath tub..we use pail and laddle when taking a bath..can i just pour it in them slowly?will the effect be the same?tnx! Hi Lanie, unfortunately it won’t work unless you have a bath tub. You need to be in the water for at least 15-20 minutes to absorb the minerals. You can get a huge plastic storage bin and fill it up with water and use as a bathtub. Just put the tub on the bathroom floor. Works great for kids. When my children were small I often bathed them in my (deep) kitchen sink. When I was small, my mother used her washtub. There are baby bathtubs sold in stores. Any tub type container that is large enough could be used. Thank you Marianne. True! If you are giving the bath to a baby or small toddler I think it will work fine. Can you use magnesium gel instead of flakes or Epsom salts? Hi Lisa, as far as I know, you can only use the salts or flakes for the bath. I just wanted to comment that you can also find magnesium oil at the health food store. We spray on the bottoms of our feet for a good night’s sleep. I also used it on my legs during pregnancy and it alleviated the excruciating cramps!! It is strong for sensitive skin, so I think it’s best on feet bottoms for kids. Thank you! Good to know ???? Thank you for your comment Nikkie ???? I have a question…my baby is give months old and had his first cold. Would this bath be safe for him? Should I ask her pediatrition before doing it? Hi Katie, It is always a good idea to consult with your pediatrician. I have been giving my baby detox baths since she was about 10 months old. In babies, it is important to make sure they do not drink the water. Magnesium has a laxative effect. Absolutely! My kids are 5 and 1. I give them this bath once a week during flu season. I see a lot of things online that are not safe to use, people think it’s funny to post things that can harm you if you do or use them, So my question is this for real? And is it really safe to do? I don’t want to harm me or my grand children. Hello, thank you for your message. I completely understand your concern. You should always consult with your doctor or pediatrician if you have any doubts. This works for my family and after doing research and asking my doctor we feel it is completely safe. Hi, I don’t see why not but making sure he doesn’t drink the water. Would this be safe for a 4 month old? She has the worst stuffy nose–only at night so this may help? I don’t see why not as long as he doesn’t drink the water. What natural shampoo and body soap do you use?? Hi Mariel, my favorite brand is Babo Botanicals. I’ve been using their products for years now and I really love them. Can this detox bath be used every day while they are sick? Or just a once a week thing? TIA!! Hi Jenifer, I do it only once a week during flu season. When my kids start with cold/flu symptoms I give the detox bath that same day. And yes, they sleep all night with the help of magnesium! My daughter is sick I tried this last night and she did get a little better. Can I give her another bath tonight? Hi Heather, I am so glad! It is really not necessary because she already absorbed the magnesium and cleaned the body from toxins. It is recommended to give the bath once a week. Hope this helps! My daughter has been sick for 3 days with fever, throwing up and is congested. I took her to the doctors today and they told me it’s just a virus and she has to wait it out. Do you think this bath will help? Hi Lani, Yes! Absolutely! The bath will also help her relax and sleep better. Omg I forgot a step I forgot to rinse the kids after their baths. Is that bad they were just soaking not really washing. Just soaking and playing. Hi Sarah, Don’t worry about it! The Epsom Salts will make their skin a bit dry that’s why rinsing well is a good idea. I put some lotion on their skin as part of the bedtime routine. Baby massage and all. Hi, I started giving this bath to my daughter at around 6 months old. I don’t see why not but just make sure the baby doesn’t swallow the water. Remember I am not a doctor and it is always best to ask your pediatrician. Hope this helps! Yes! The baking soda helps clean the water but you can just use the Epsom Salts and it will work well! Thank you. You are going to see that it really works! I loved your article. Next time my granddaughter comes over I will try it. Thanks for the information you provided. Came across this in absolute perfect timing! Can’t believe I never thought of this, I always grew up taking person salt baths. My 18 month old is coming down with a minor cold and I know this will help! Thank you for your comment Michelle. I will try it tonight I have 2 little ones with the flu I’ll let you know how it goes thanks for sharing this with us. Thank you! Please tell me how it goes. It works great for us! How did the bath go for your babies??!!! My son currently has the flu. Tried this with my sick 16.5 month old and it worked like a charm! That’s wonderful! It works great for us too! Great! Let me know how it worked for you. Hope it helps! I was wondering if using Epsom salt with lavender be okay to use for the detox bath? Hi, yes. Lavender is great! Actually magnesium CHLORIDE is approximately 10 times stronger than MgSO4 and is much better in a bath/foot bowl. Thank you for this idea. I am going to share this with my daughter in law. I am a preschool special ed. teacher this will be helpful for my students moms as well. Thank you! Glad to know the article will help other families. Hi, my son is 58lbs. I noticed that you had put if they are over 60lbs to use 1 cup. I just need clarification: 1 cup of epsom salts or 1 cup of baking soda? Is it safe to assume its for epsom salts? Hi, you can use 1 cup of Epsom salts and 3-4 tablespoons of baking soda. Hope this helps. I will just use one measurement for both kids. 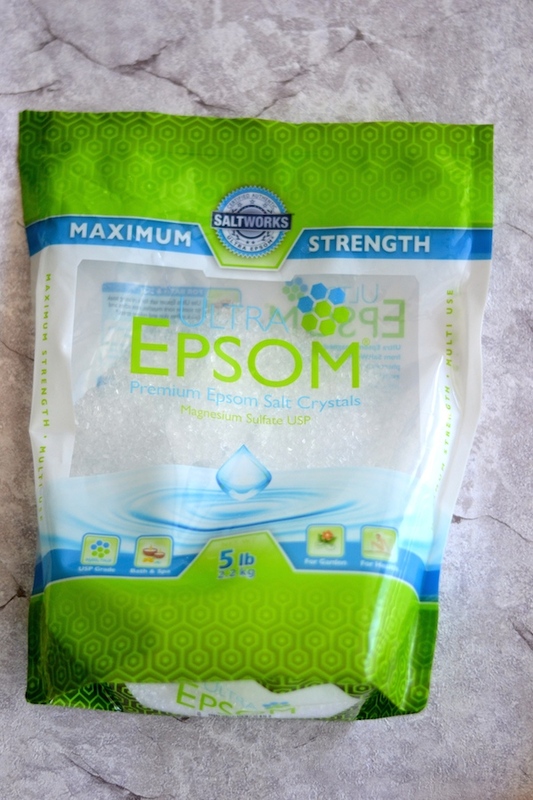 1/2 cup Epsom salts will be enough. Thanks. I am interested in this as well but my daughter is going through a phase where she keeps drinking her bath water and I am not fast enough to stop her every time. Should I wait for this phase to be over before I start trying to start these detox baths? Hi, if she drinks a lot yes I will wait. Magnesium can have laxative effects. Hello! What was the cool contraption on your tub faucet? Can’t wait to try this bath and some of your other tips on my kiddos this cold and flu season. Remember that it is always a good idea to consult with your doctor before trying a natural remedy. In my opinion this bath will help. Thanks. What is the frequency in which this can be used? Is it bad to bathe kids in this a few nights in a row? Recommendations? Hi, a few nights in a row is not bad but I usually give my kids this bath once they start having cold symptoms. One is enough for it to work. I try to give them a detox bath once a week. Hope this helps. Hi my daughter is 5 months old and has been congested for a week so you think it’s okay to give her a detox bath? I personally think it is ok but it is always a good idea to check with your pediatrician. Hope this helps. Hello! If we go the the pediatrician and receive a vaccine, how soon should we do the detox bath? Same day? And after soaking, do we rinse on in the shower or just dry?